Digital Extremes, the team behind Warframe, have revealed their next game. 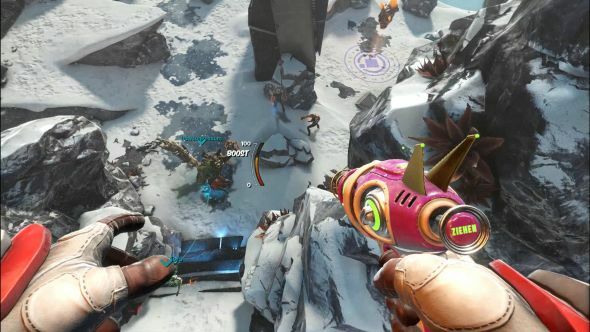 Called The Amazing Eternals, it’s “a fresh take on the hero shooter genre,” combining a fast-paced FPS with a collectible card game. Today, Digital Extremes are announcing the game’s Founders Program, which will allow players to help shape The Amazing Eternals, as well as rewarding them with “ exclusive in-game gear, instant access to the Closed Beta, and more.” You can sign up for a chance to access the beta now, or enter the game instantly when the Founders Program launches on August 29. The game is presented in the form of a mysterious board game. At the start of a match, you’ll leave the board behind, and be sent directly into the game where you’ll inhabit the body of your ‘eternal’. These characters are in an “endless battle to harvest the essence of a keystone,” which seem to be focal points of the game’s maps. The Amazing Eternals will make its first public appearance at PAX West from September 1-4.